Get ready for spring with this quick and easy flower hoop with its cheery reminder. 1. If using an iron, trace the inner hoop on the fabric with the fabric marker. 2. Cut the flowers apart carefully, leaving stems on most. The tendrils are cut off and the stem and leaf sections are used for the rose and the blue and orange flower combination. See photo for layout or create your own garden. 3. Arrange letters and flowers and iron onto fabric inside traced circle. If gluing letters and flowers, place fabric in hoop first. Then, arrange letters and flowers on fabric. 4. Trim fabric leaving about 1/2" and glue to back of hoop. 5. If desired, hoop can be painted or ribbon added. 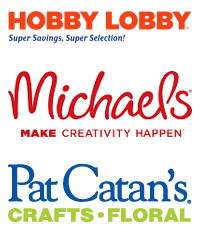 You can find Joy® embroidered, iron-on letters and appliqués at your local craft stores.